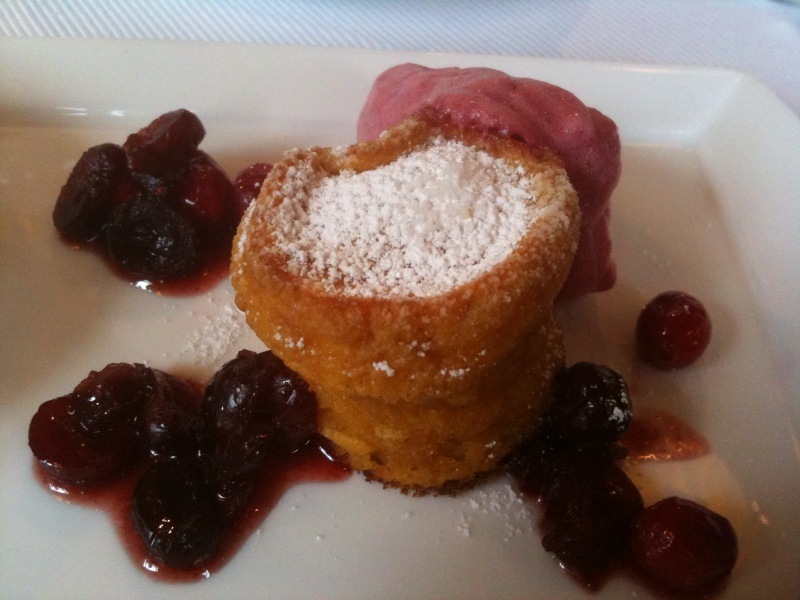 From Jean Georges in Manhattan: Warm sweet potato cake with a cranberry compote and cranberry foam. When the husband and I go on vacation, we tend to plan our itinerary around food. We’re not the only people who do this, but I get mixed reactions from a few folks, some of whom apparently expect to hear more about the shows we’ve seen in New York City (most recent count: 0) than our sake-tasting and evaluation of the freshly made tofu at EN Japanese Brasserie (evaluation: awesome). Some people get it: After a recent photo documenting our pilgrimage to the Doughnut Plant, one Facebook friend noted, “You take the best doughnut vacations ever!” Indeed, we do. So what’s with our vacation food obsession? Honestly, we eat like monks at home. We have old-fashioned oatmeal (or steel-cut oats, if there’s time) with walnuts and raisins for breakfast every day. I almost always have a fresh salad and quinoa or hummus for lunch, while the husband consistently has a ham-and-cheese sandwich. Dinner might be homemade lasagna or something easy, like a cheese sandwich pressed into submission on the Foreman Grill with a bowl of leftover Cowboy Stew. We rarely go out to eat. We’ve found that one of the consequences of cooking your own healthy, delicious food at home is that your average restaurant food doesn’t measure up anymore. What does measure up, however, is your above-average restaurant food. And this is what turns our vacations into the pursuit of destination dining. So while I can’t be bothered with a 10-minute drive to Krispy Kreme for Hot Doughnuts Now (trust me when I tell you that growing up with a Krispy Kreme within easy driving distance makes their doughnuts way less of an attraction later), I am perfectly willing to make a 15-minute hike to the subway station, stand on a crowded car for five minutes, make a 10-minute hike to the Doughnut Plant and stand in a long line for a Valrhona chocolate doughnut. I deem the calories worthwhile. And that’s how my photo albums end up filled with pictures of doughnuts, ice cream, cheeseburgers and steamed shrimp, while we forget to take pictures of ourselves. Sorry, Mom.